Tue June 19 - cleaning, Wed June 20 - general, Thurs June 20 - tapes, Sat June 23 - 4th Sat. Allen Palmer was fighting tape problems. Things that were working are now not working well. Ron says that Allen sniffs out food. Allen found the remains of a breakfast event at CHM. "... bunch of left over fruit, cup cakes, healthy stuff, mellons, pineapples - he sniffes it out"
Presemt were Ron Williams, Bob Erickson, Grant Saviers, Tim Coslet, Dan McInnis, Ed Thelen. Then when Dan McInnis came in to keypunch his object deck, we found that Salim's keypunch didn't work. Bob Erickson found a relay (related to punching alpha (not numbers) was getting very hot. 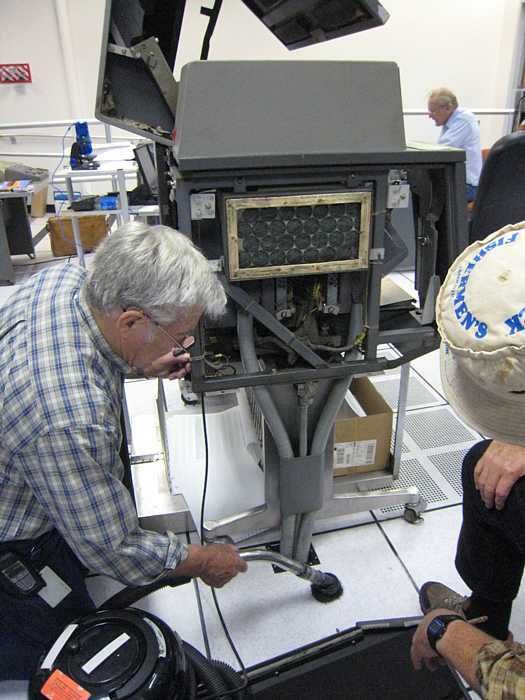 Then he found a relay that had been swapped out of the 3rd 026 keypunch (with out a note or a tag - naughty naughty). Grant Saviers came by and had an extensive conversation with Bob Erickson. 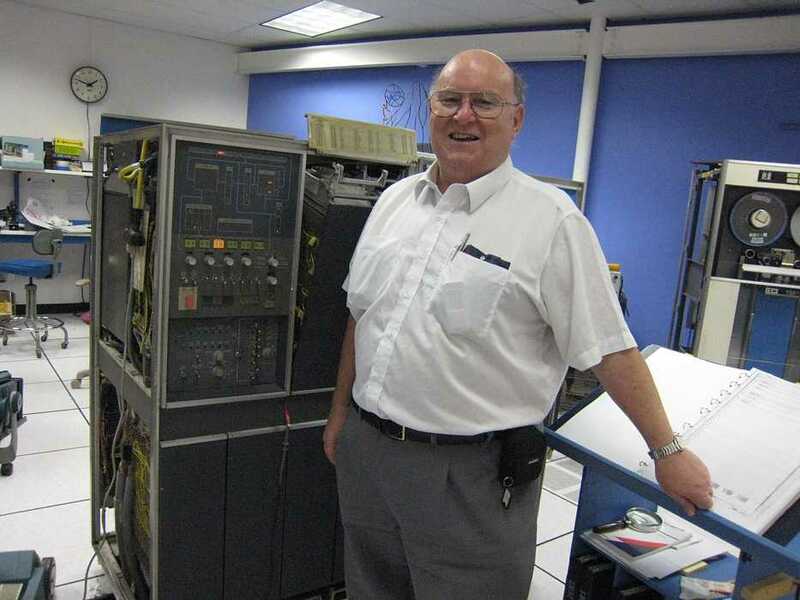 William Caulli (Brisbane, Australia) came in and said that he was involved with a similar 1401 configuration as ours except they had 6 tape drives and only 12,000 characters of memory. He was quite excited about seeing our system and seemed *very* conversant with many details of hardware and software. 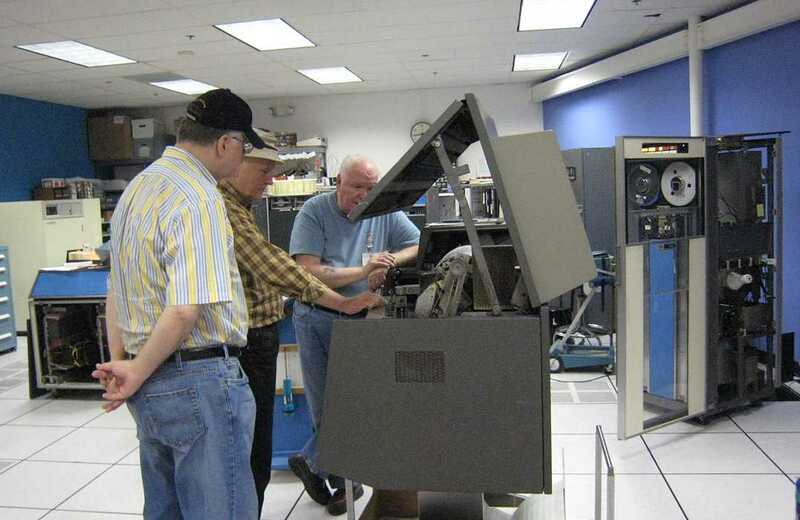 He started talking about code breaking with the aid of a 036 sorter with a count printer attached. 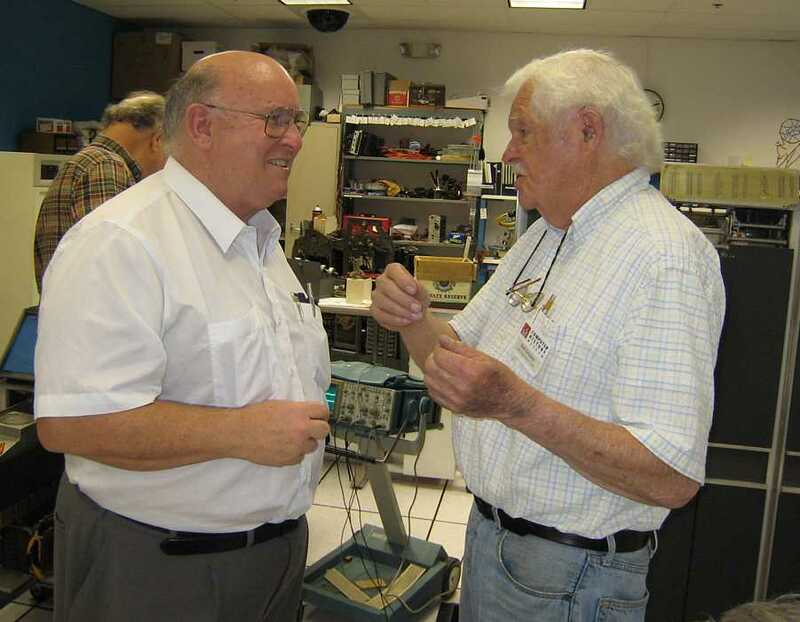 Soon he and Bob Erickson were talking about the breaking of the Japanese code called J26 using IBM unit record equipment. Mr. Caulli seems involved with the MacArthur Museum Brisbane, especially the upcoming code breaking section. We made a Banner printout with his name. 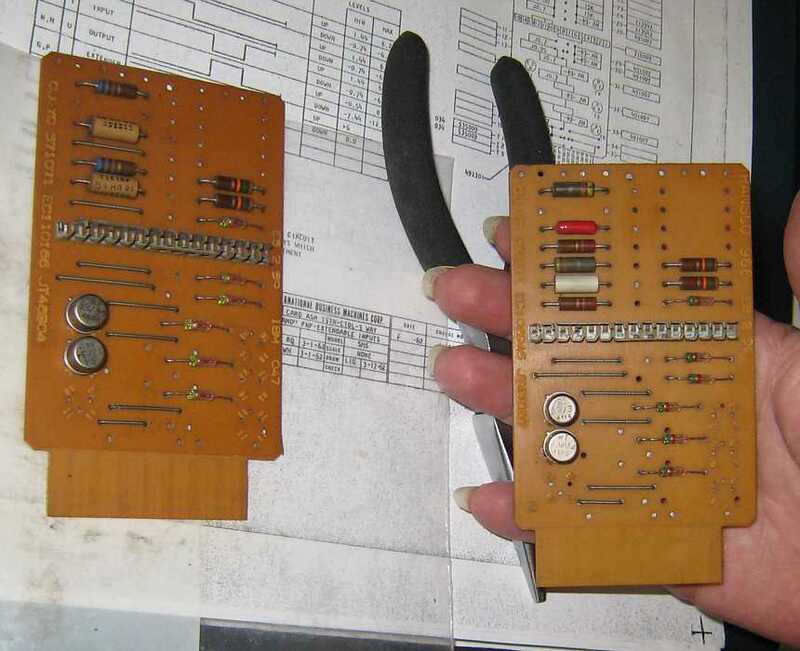 Tim Coslet said the left board was made by IBM and the right board by Transco. They are different - two resistors in the upper left quadrant are replaced by wires. The total resistance is 680 ohms on IBM board and 250 ohms on the Transco board. 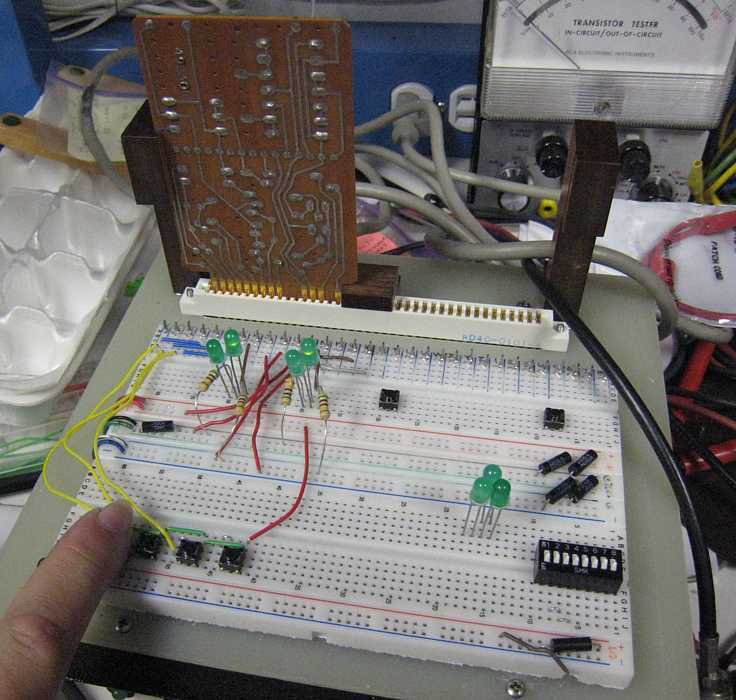 Schematic of the board Test jig showing both circuits working well on the IBM board. The Transco board was in spec, but did not light the second light. - June 11th, 083 Sorter status from Frank King. "Ed, right now I am missing feed knives. Trying to locate one set and waiting for machining on another. After I get a good set I still have a jamming problem in the chute blade pocket selection area." Present were Ron Williams, Bob Erickson, Frank King, Glenn Lea, Joe Preston, Robert Garner, Ed Thelen. About the white gloves. I think it was humor - in our greasy environment they are almost never used. Maybe the bandits did not want to leave fingerprints - for many reasons. Ron Williams is chasing the source of this short improper pulse. 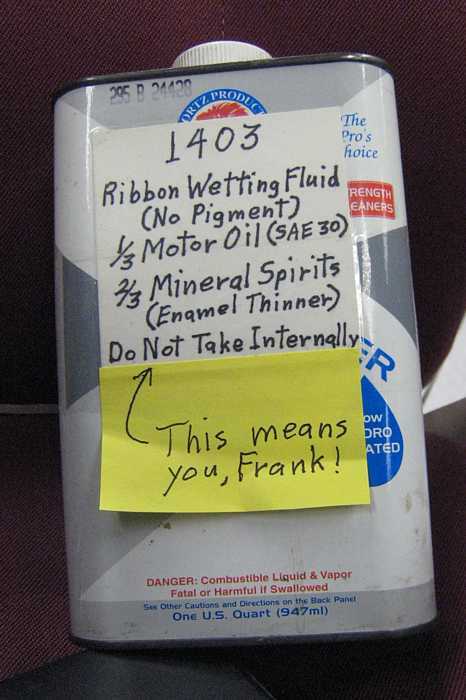 Could it be causing our remaining 1401 quirks?? 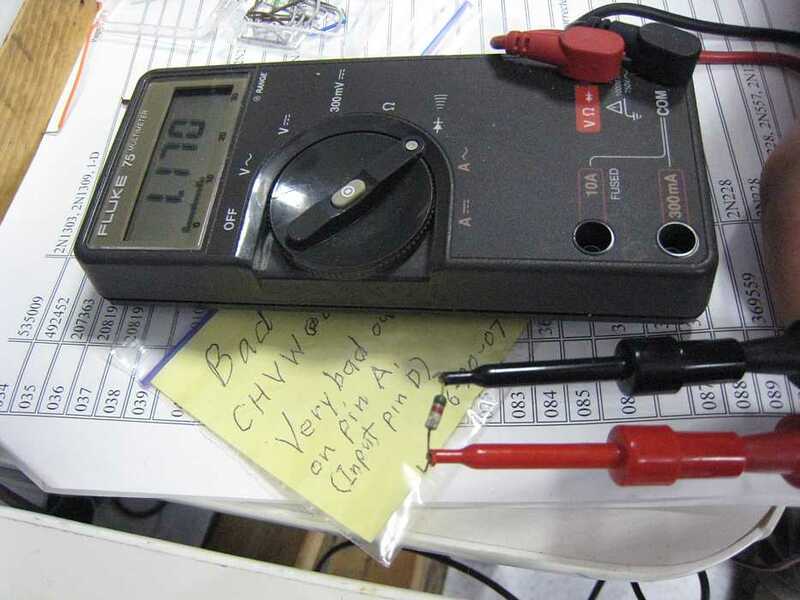 Later, Mike Cheponis sent "Ron showed me this - we put a 10 nf to ground on this pin, and this brought up the glitch to -3 volts, and a little bit smeared the trailing edge of the pulse. But the program still had the same incorrect behavior. (That is, the glitch does not seem to be causing the incorrect behavior.)" 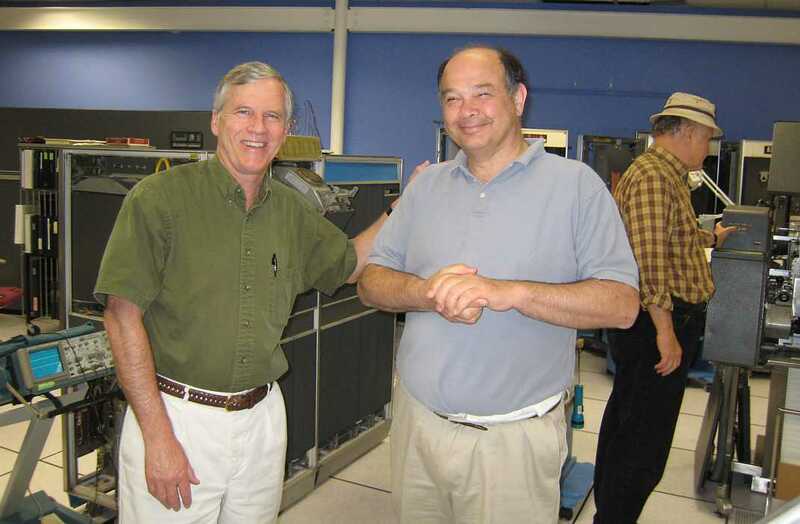 Robert Garner and guest Peter Capek have known each other at IBM for many years. 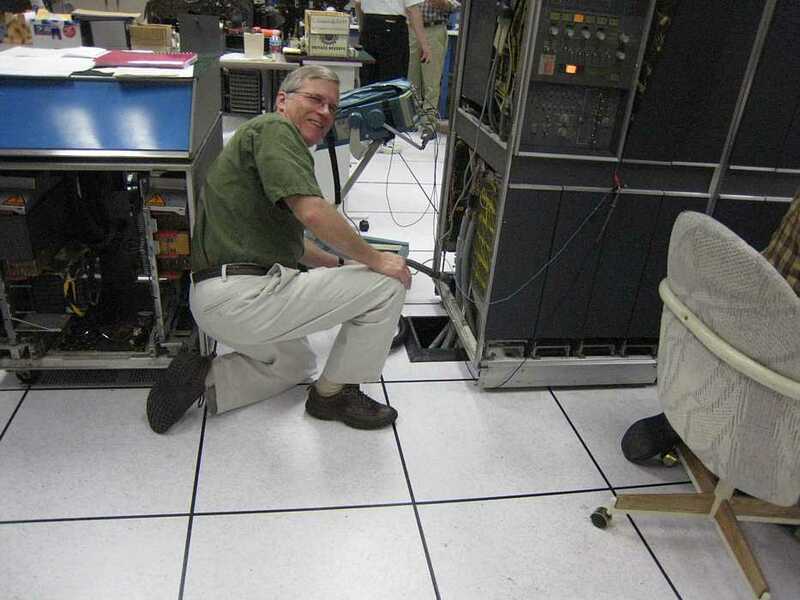 Frank King noticed black dust on the floor on the cable side of the 1403 printer. What is going on? Is this indicating a problem?? 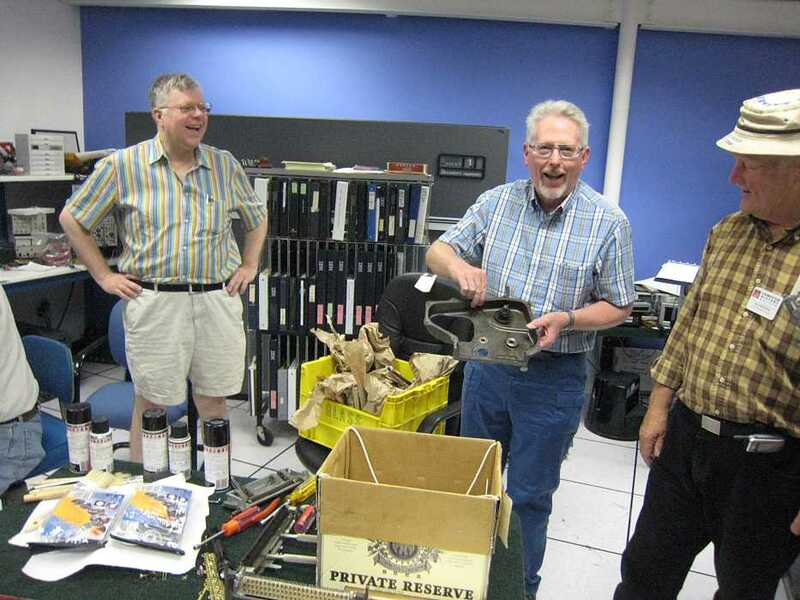 (Left to right) Prof. Michael Mahoney, Princeton University, Doron Swade, and Alex Bochannek and Bob Erickson talking over the plastic enclosed 077 collator. 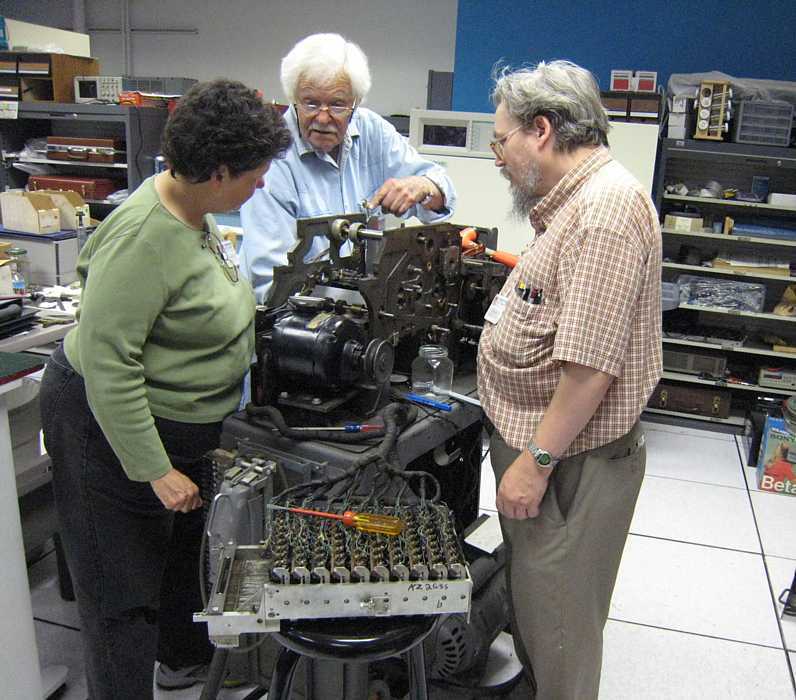 PostScript: I got to talking with Ron Williams about quirks of the 1401 processor. - "T" logic which swings +6 to -6 volts. The 1401 TAU (Tape Adaptor Unit), has many different cards than the rest of the 1401. We got to talking about power up sequencing of the 1401. 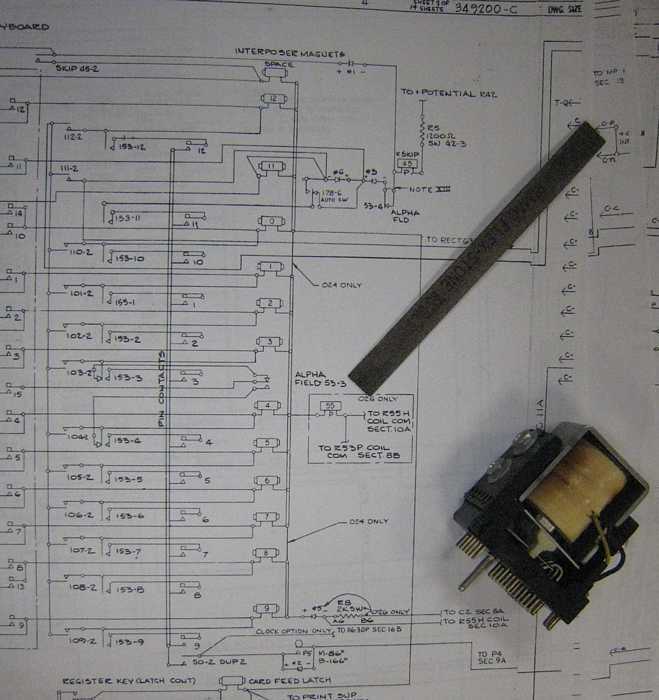 If there is a problem, such as an open interlock or bad relay contact, you can have a very interesting time blundering about. I think a good introduction to 1401 trouble shooting would be a study of the power up sequence. 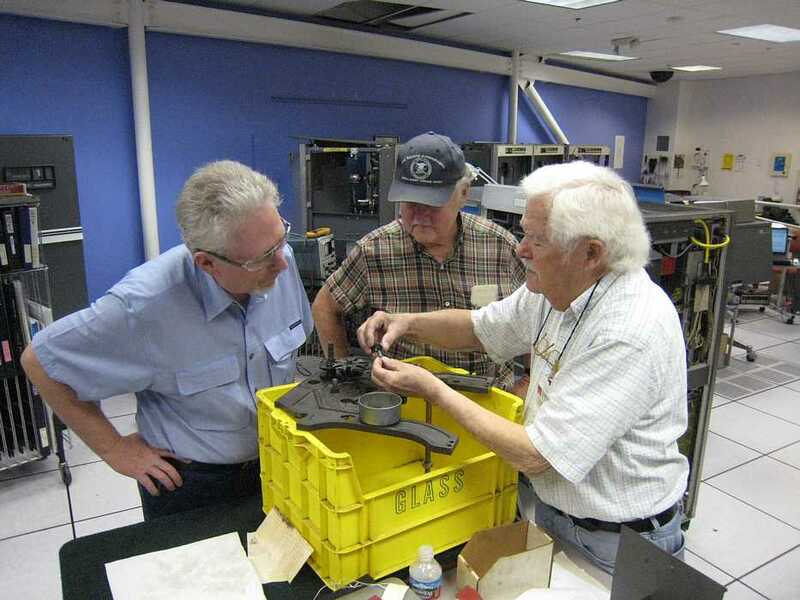 Ron was introduced to the 1401 that way, and I was introduced to Nike fire control and the GE 225 that way as well. On the subject of the Card to Tape diagnostic getting tape errors. The fact that this appears to only happen if reading the card takes enough time that the go line to the tape unit is dropped then raised may be a clue that the prolay is not getting the tape up to full speed before writing starts. If this happens the characters will be too close together on tape. 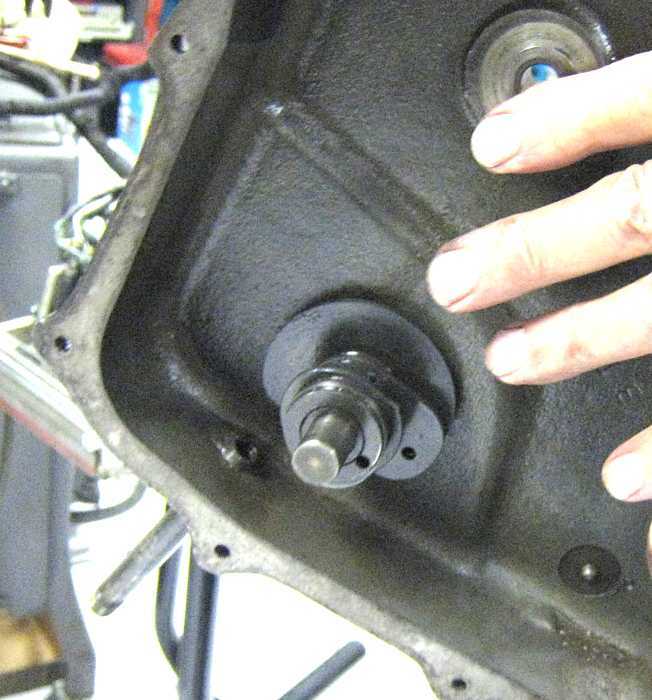 This can be caused by too large a go gap between the prolay idler and drive capstan on the right side. Another cause is the left side prolay "glitching" caused by overthrow when the arm moves from the stop capstan to the neutral position. 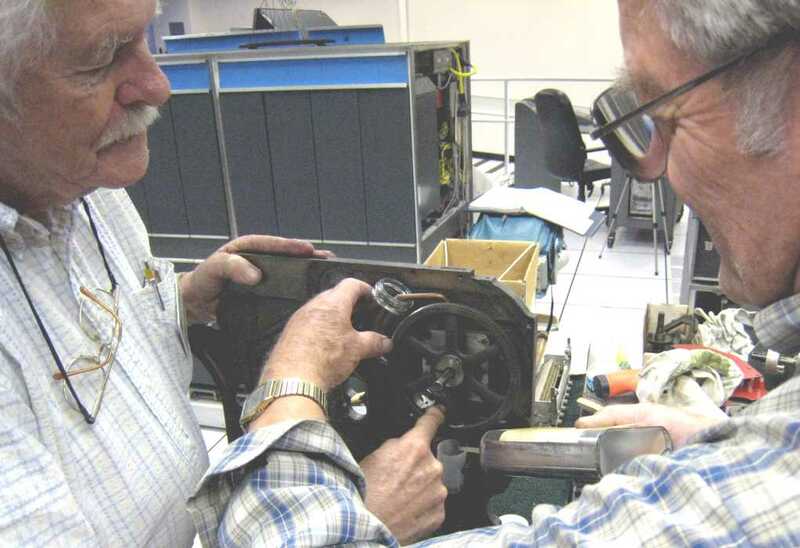 If the left side idler to capstan gap is too close or there is too much slop in the idler, arm and armature pivots it will momentarily go past neutral and hit the drive capstan slowing the tape. When you worked on prolay machines all the time you could walk into a room and recognize the "clacking" sound when they were glitching. I used to demonstrate this to CEs in field schools I was teaching by setting the off-line tester to read an all bits tape with a short go down time. Then I would move the left prolay closer to the drive capstan until we could hear the glitching. Looking at the preamp output on a scope you could see the dip in the start waveform caused by this. It's going to be hard to get the system up to error free performance with the lack of parts. We used an enormous amount of prolay nylon idlers and their shafts. The original idlers were white nylon that was almost translucent, then a solid white, then black. In a shop that ran 24/7 they would get a grove worn by the tape along with bushing wear. The idler shaft, arm shaft and armature shaft are probably standard drill rod sizes that can be bought at an industrial supply house. Before the navy I was a machinist that made parts for sock knitting machines and I used to order it all the time. Now I have gone to rambling again. One of the best things you can do to help the TAU debugging is to get a second 729 working. That's the best way to tell if the trouble is in the TAU. I think the goal of substantially increasing the reliability of the machine ought to be our first priority, and encourage us to develop some plans to do this. Cleaning and checking cards is one approach. 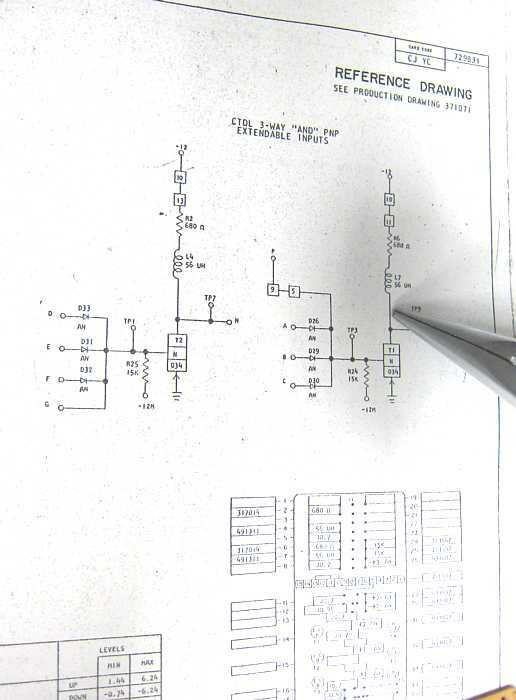 Another is to use the margin capability in the machine to isolate marginal circuits. Thoroughly testing most SMS cards and weeding out the weak semiconductors is a third. 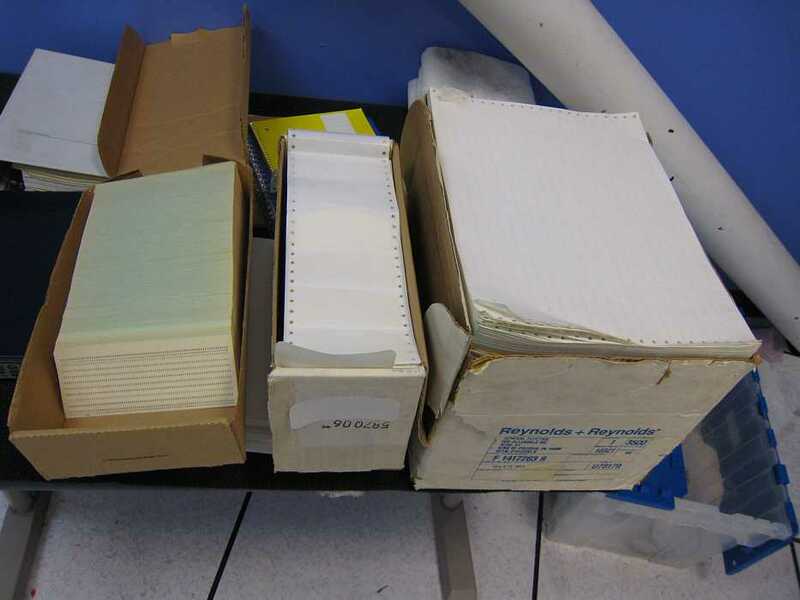 I would suggest testing each card during the cleaning/inspection removal process, or removing cards of the same type in a bay and replacing them with known good, tested cards as a way to maximize up time for overall system margin testing. In many cases we have enough spares to do this on at least on a partial by bay approach. So the challenge is to have known good cards and that requires volume testing. Finding some more spare SMS cards is also desirable where we have few or none (50% of card types). 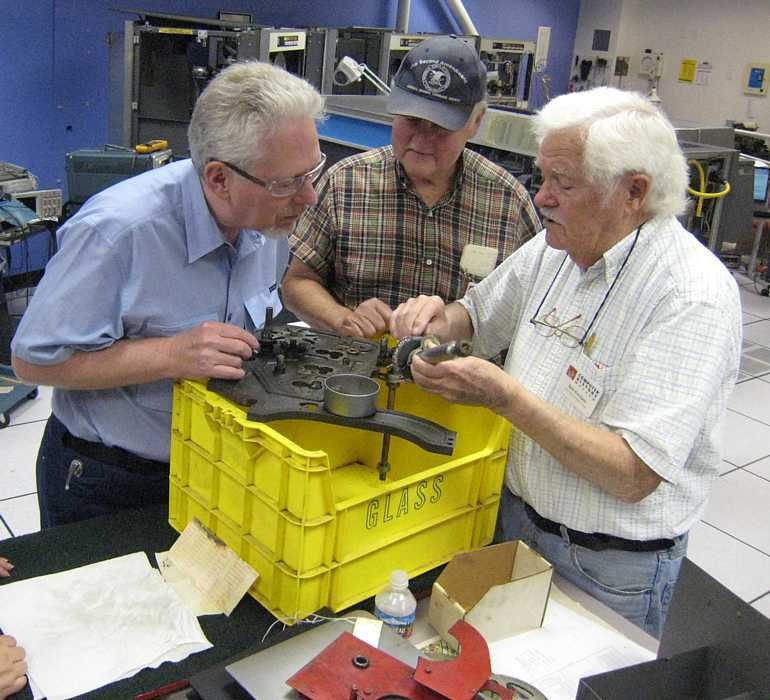 With the conclusion of each round of module testing, inspection, and cleaning, run the machine diagnostics and use the margin test supply. I tested the portable margin power supply with negative results and concluded that its design needs to be documented as the test conditions I used may have not been appropriate (load resistor only). Assuming we gain confidence in this supply we still only have the ability to test the entire machine under margin which I think may be unproductive (too many simultaneous bugs to shoot, but this assumption is easy to test by testing the whole machine under margins). I inspected the power terminal blocks for each gate and I think it is feasible to install a reversible modification (plug) that would allow margining by gate. 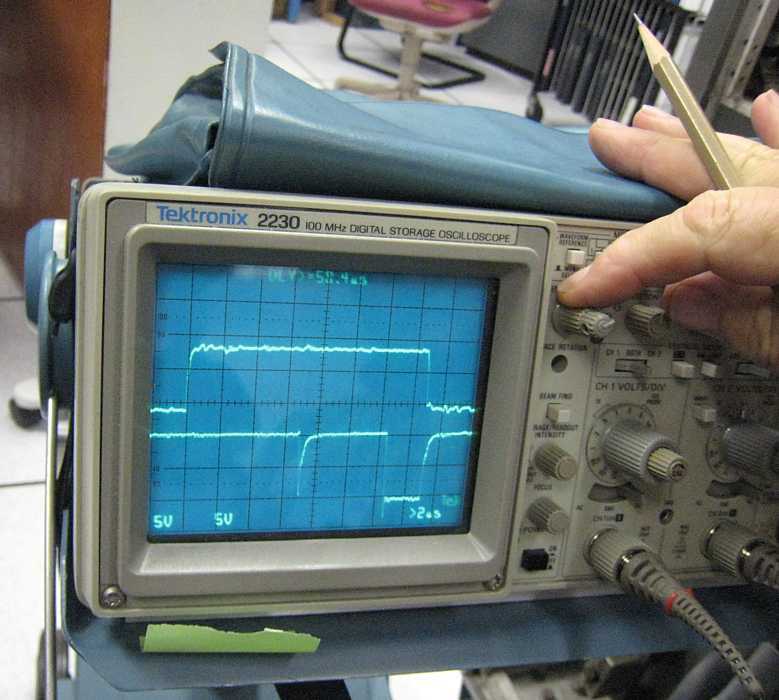 The logic test should use input signals at the specified minimum input voltage swings. The margin supply should be able to be set at three levels (max, nominal, & min) and the logic function test performed at each margin level. The logic function should be checked hot (125 F?) and cold (50 F?). A "universal" tester that is connector programmable. For a while I thought a 96 pin wire wrap connector could be used as a crossbar for test signals and logic inputs, but this got to be too complex considering the number of SMS circuit families (P, N, etc) and number of logic test signals needed for all types of cards. In other words, I propose build simple testers that most any engineer can understand, use, and fix. Never have to worry about the next release of Windows. The tester approach is to provide a few number of mildly customizable testers that are self contained (power & test signals). The test output is observation of the card section outputs on a scope as all states of each logic section on a card are free running cycled. Every input of each logic section would be tested. Scope sync is provided for the free run test loop. For special cards, eg 1403 hammer drivers, core sense amps & drivers, 729 read amps, either don't test them, or build special purpose testers. I would make each tester complete with it's own self contained +12, +6, -6, -12 and both margin supplies with high, nominal, and low outputs. This is a little more work but yields redundancy of test capacity. Volume card testing can commence as soon as the first tester is built. A 4 bit synchronous counter and a few gates can produce the necessary logic test signals. All of the trigger inputs and states (and set up times met) can be tested with 4 bits. Most of the gates are 4 or less inputs (plus expander) wide and back to my idea of a plug crossbar, a 25 pin or so connector can personalize the gate testers for each card type. (test signals to inputs plus loads as needed). able to set rise/fall times with a capacitor. The double width card test box that I made is the mechanical model, but it only needs to be one card connector wide. I've got most of the parts (connectors, voltage regulators, logic, boxes) to build 3 or 4 testers. The hot/cold temperature chamber is a Peltier device with heat sinks and mini muffin fans both sides in back to back recirculating chambers. The bottom is open so either hot or cold air can be circulated over the card under test. A variable current source controls the temperature differentials. A next step would be to debate these ideas, get a team together to design & build card testers, and to develop a plan for cycling inspected, cleaned and tested cards through the machine. I'm out of cycles to finish the design and build testers on my own. My shop is available to the team. I cleaned, vacuumed, and deoxit Row F of Module B, Gate 1 this evening. Machine still seemed to work when I was done, so I probably didn't break anything. Attached is a photo of a typical card as removed before cleaning. The rest of the photos are in http://web.1401.org/Module_B/Gate_1/1401__Module_B__Gate_1__Row_F.zip - This file is 76 MB so I didn't want to attach it to email. I've also included in that .zip file a .txt file with the card types for that row. It's interesting looking at these. Card 5, type KA, has that burnt-looking resistor; I could not find an identical type KA card in the spares, so I did not replace this card. 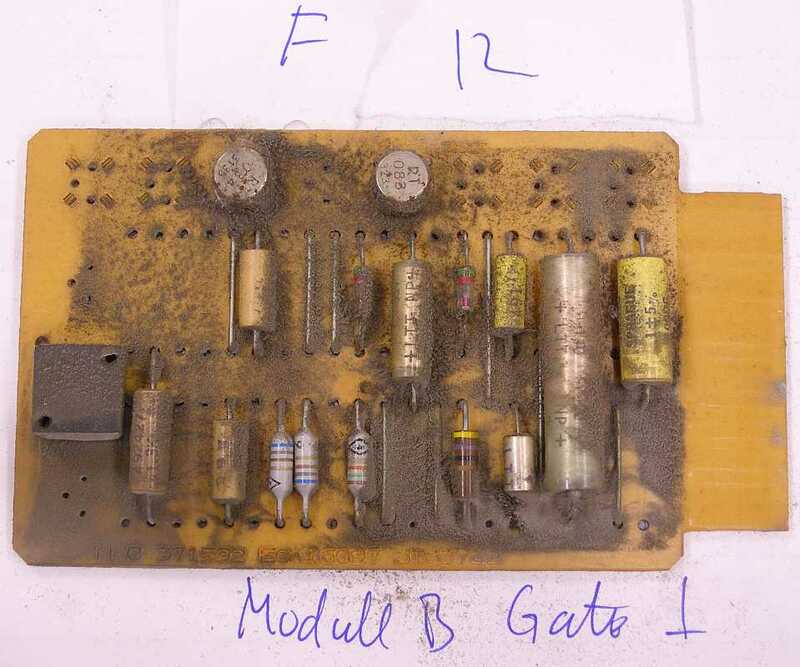 Card 25, type QC, has 2 power transistors that had a piece of insulation glued on top of the TO-3 cases, presumably to prevent it shorting out the adjacent card (or maybe for thermal?). Anyway, the one remaining dark disc of insulation fell off the transistor, and so, insulation must be placed on this card, on both transistors!!! I re-installed this card without insulators (I did not have any insulating material handy) so that I could test the machine. There is clearance, but I think either this card should be replaced or some sort of insulator needs to be installed on this card. 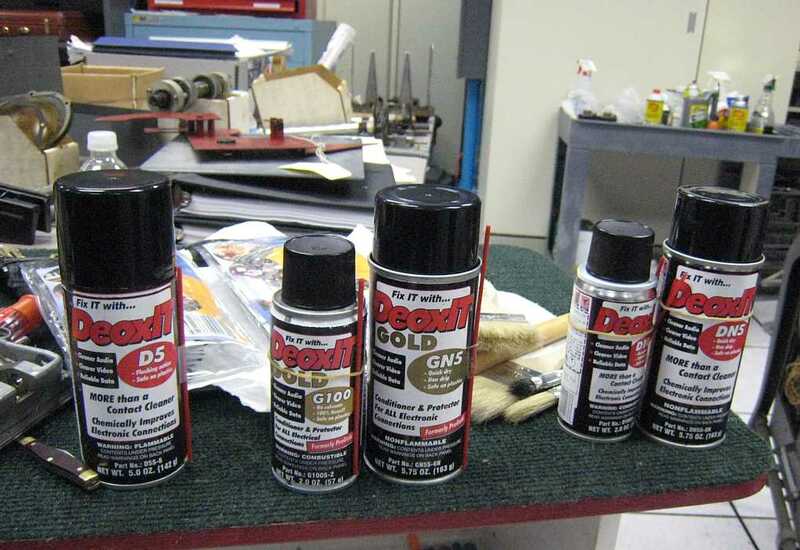 Then perhaps to Module A, the one on top, and then to the modules on the right, modules C and D.
It took 2 hours to remove, photograph, clean, vacuum, dexoit on contacts, and deoxit gold on gold contacts for these 23 boards (and another hour to tweak-up the photos) . Therefore, if the rest of the modules are similarly fully-loaded with cards (and I know they're not), the total number of rows in the machine is: 6 rows per gate x 8 gates per module x 4 modules = 192 rows of cards, meaning it will take 384 hours to clean the CPU box. If we figure I can get it down to 1.5 hours per row, and that about a module's worth of power supplies exists, then that's around 220 hours. At 4 hours per week devoted to this task, it'll take about a year to finish; and the work really needs to be done when others aren't using the machine. 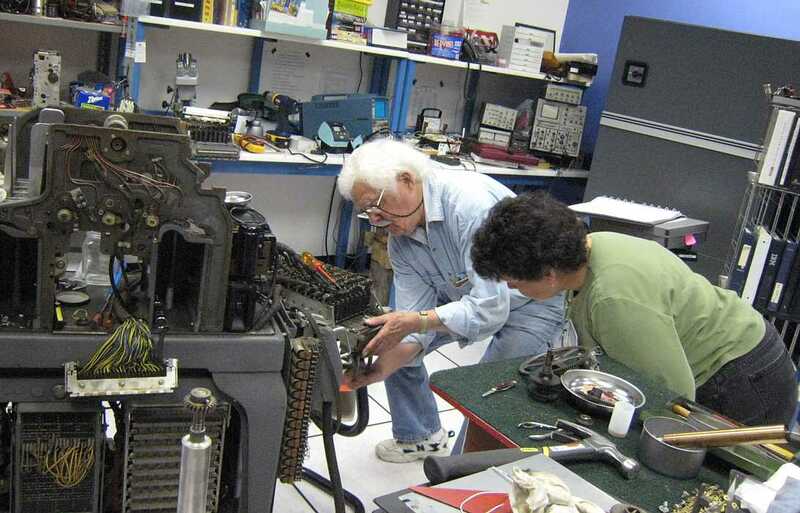 Bob Erickson and Frank King worked all day on the 513 reproducing punch. 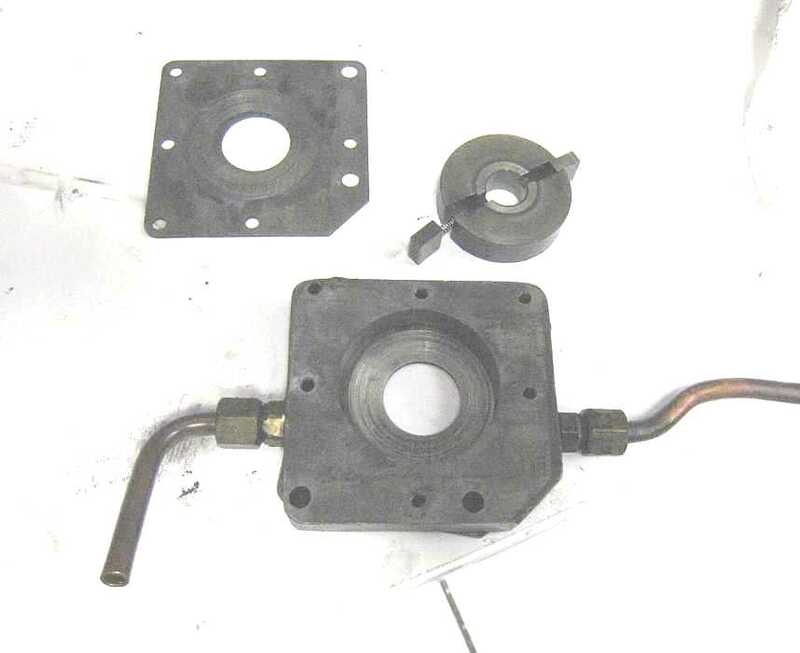 Here is the warn oil pump. Note the scoring in the rotor chamber and on the face plate. The roter (operated in an eccentric mode, like a Wankle engine) seems fine. The two wipers and their springs seem just fine also. Frank was proposing to flip the scored faceplate over, use a flat grind stone to flatten it, and use the "new" side. I don't know the final result. 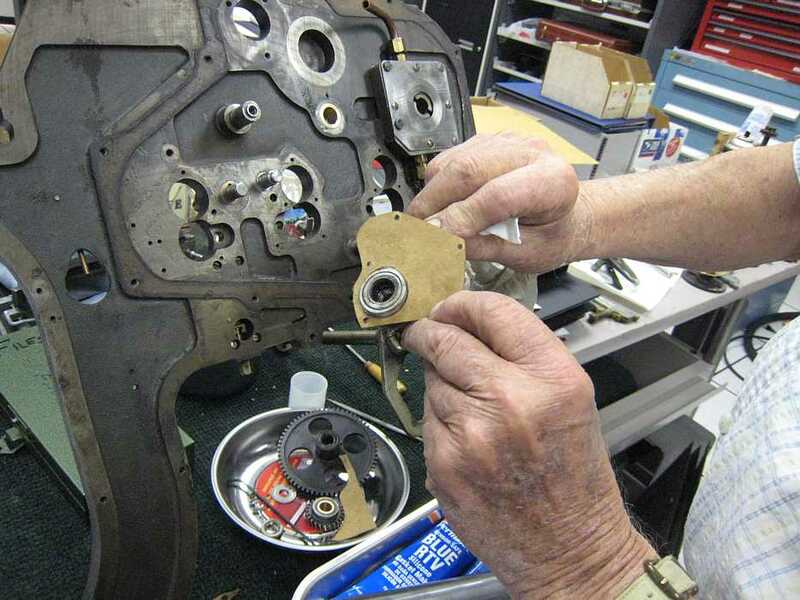 Frank was cutting gasket material to replace those torn in disassembly or otherwise damaged. Here Bob shows part of the results. 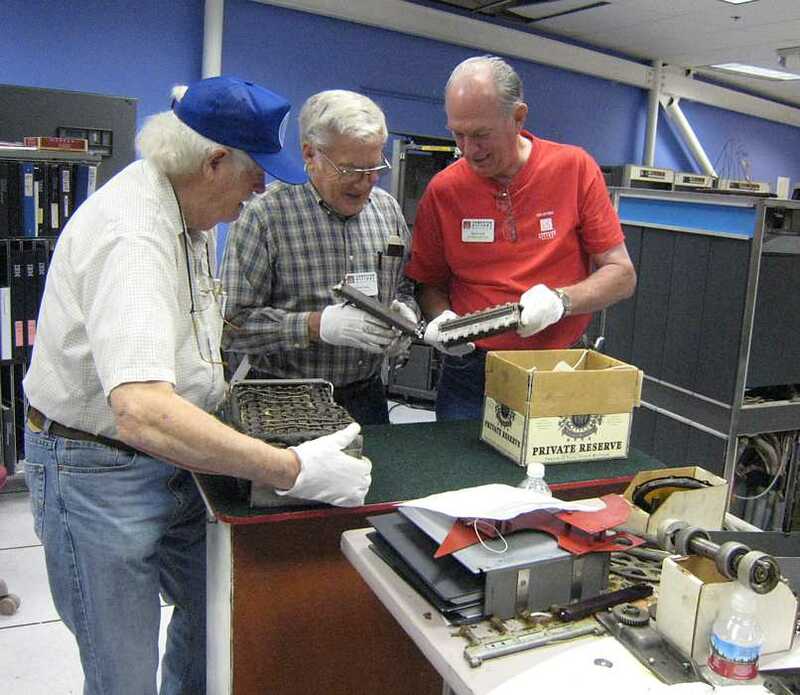 Bob and Frank are getting organized to re-assemble the 513. 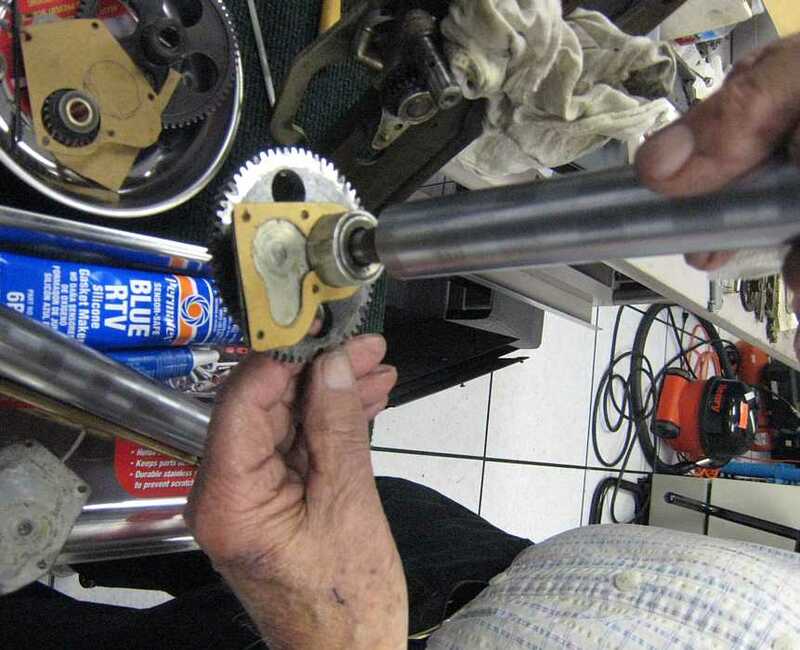 No small task - not only do all those weird parts have to be stuffed and crammed back in somehow, but the gears, cams, levers, ... must be "timed" so that the correct things happen at the correct time in the card punch sequence. 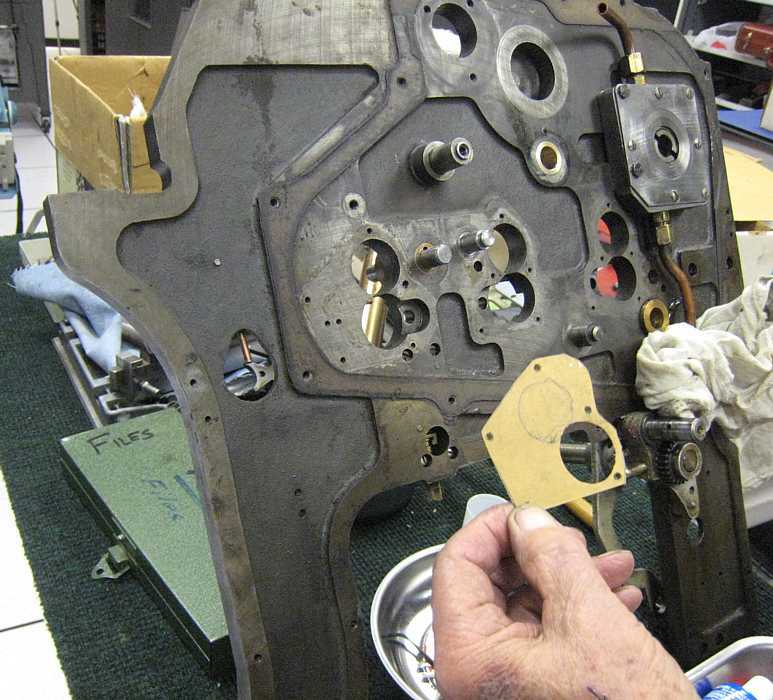 Note that the oil pump has been re-attached, and the scored side of the face plate is indeed facing out. Bob keeps muttering "one tooth past 14". I worried about his sanity, but this gear and reference point is what he meant (he says). And please don't ask why the sequence 9, 13, 14, 12 - maybe the two punch rows between cards are 13 & 14 ? Then you "back off seven teeth" and some levers can slid over these cams with out jamming. Joe Preston has the third 026 key punch working. He says that the printing is especially good. Robert - do you think Joe deserves a gold star and 10% raise?? Ron Williams is a dreadful tease. Here is his recipe for refreshing dry printer (and keypunch) ribbons. I believe he intends for this concoction to be misted onto the moving ribbon. Mike Cheponis showed his , that permits much easier word mark placement in short programs - not generated by an assembler which generates code in the object deck to place the word marks. P.S. Frank King says that a CHM contract van and mover(s) will be at Werner's in Portland, OR July 20th. He is a little busy around then and prefers some other 1401 expert to help select materials not currently inventoried (like buried in the piles) for transportation to CHM and the 1401 Restoration effort. If a diag deck used to load, but won't now, I'd check the order of the cards in the deck. They may have gotten shuffled. I loaded 5040 today and it read fine. We determined that the I/O channel terminator shoe that has black tape wrapped on its cam lever is intermittent. The drive select operations worked fine using the other terminators. We found a broken ground wire in the 729 read amplifier gate. It didn't seem to be related to any known problem symptoms. I believe that we are having tape drive port select relay problems again. The 729 we are using has a dual port feature. When we access the drive from port "A", the C-bit in data bytes get dropped. When we access the drive from port "B", the A-bit in data bytes get dropped between the final read amplifier and the channel cable. There are only wires and the relays in between these points. I'll contact Andy and see if he wants to and can help. Present were: Ron Williams, Bob Erickson, Bill Flora, Tim Coslet, Ed Thelen. Judith Haemmerle joined us after 11:30. Mike Cheponis came in after lunch. Judith Haemmerle signed up as a candidate maintainer, having worked on slot machines, pin ball machines, clocks, and other physical things - but worried that her lack of working on big stuff would hurt her chances of being selected. 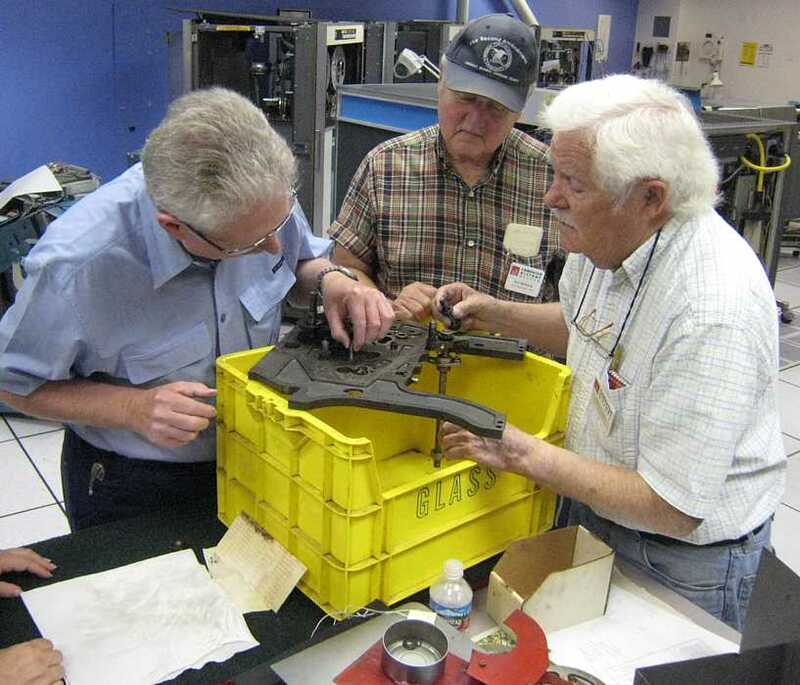 I said come to the 1401 room and enjoy working on restoring a 513 reproducing punch. She seemed to fit right in. re: the Werner IBM unit record equipment - Mike Zahares came by and said that his contact in Portland discovered that the Werner house has a septic drain field under the back yard. Mike thinks that the required sized fork lift might crush the tile pipes under the yard, and/or get stuck in the wet soil. Mike is thinking of getting a crane to lift the heavy items (especially the 407 accounting machine) from the back basement door to the van. I told Mike that Paul Pierce thinks he is loaning his IBM 709 to Dag Spicer, and is waiting for the truck to arrive. That is not currently part of Mike's task. Tuesday night Bill Flora sent this list of belts. - Certainly not for our little 1401??? Also Tuesday night, K. Bleher (of HzG in Sindelfingen) the e-mailed 1401 ALDs 42.67.01.2 and 42.67.02.2. Much appreciated !!! :-))) Thank You Very Much !! The problem with the 'A' channel was a bent relay socket connector contact finger. Removed, straighten, replace contact finger. 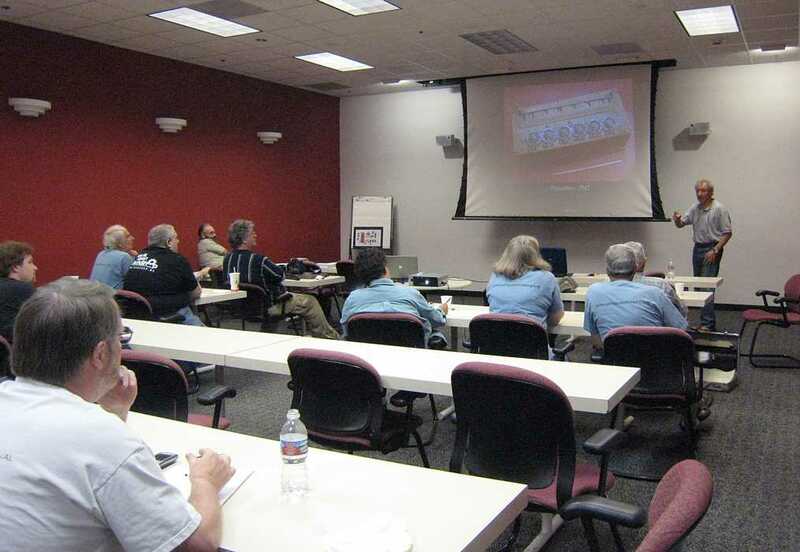 Present were: Ron Williams, Bob Erickson, Frank King, Joe Preston, Judith Haemmerle, Robert Garner, Ed Thelen. We ran the Big Print demo - and began getting card reader halts, like a mis-feed in the card reader. It seemed to be the second card of the deck, so we reproduced it on a key punch. We decided to reproduce the Big Print demo, using the 1402 Card Reader and Card Punch, similar to last Saturday. Well, the first card in the card punching jammed. OK - Then the fun began - how soon (40 years) we forget. Bill Flora the 1402 chief wasn't there, and the rest of us looked like the Marx Brothers. I dived into the back side, and was corrected by the experts that operators were not allowed in the back side, and this `	was only a card jam, and operators routinely cleared jams. But we couldn't get the card die out any other way !! Frank King will be away until August. 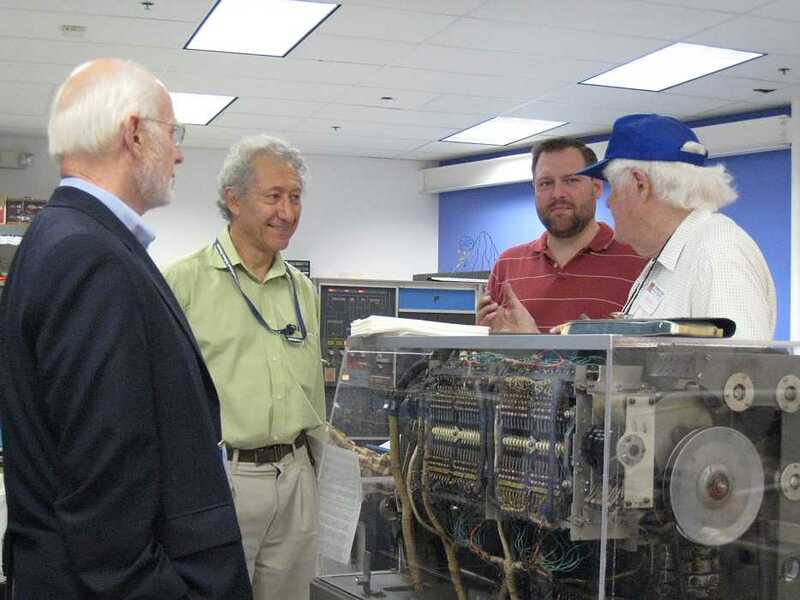 Among other things, he will be in Portland, OR, July 20th to consult on the moving of the IBM equipment and selecting documents to bring back to CHM for possible accession. I think we should suggest that the moving company bring boxes for at least 20 cubic feet for possible usage in holding documents. (There was so much stacked about and buried that we don't have a good estimate.) 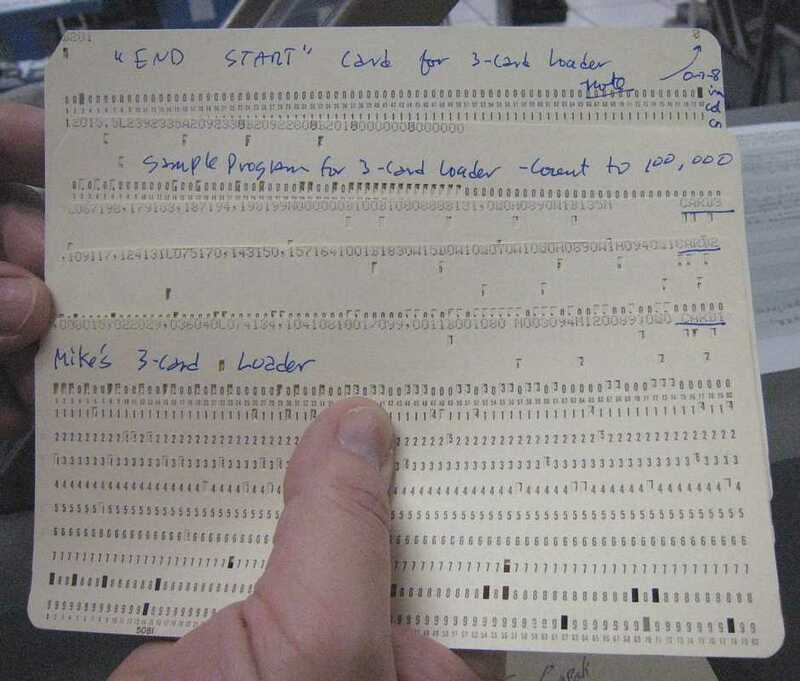 We would like to bring any blank IBM cards, but probably should recycle the cards that have holes. Robert Werner showed us old decks with names and addresses of members of various clubs. 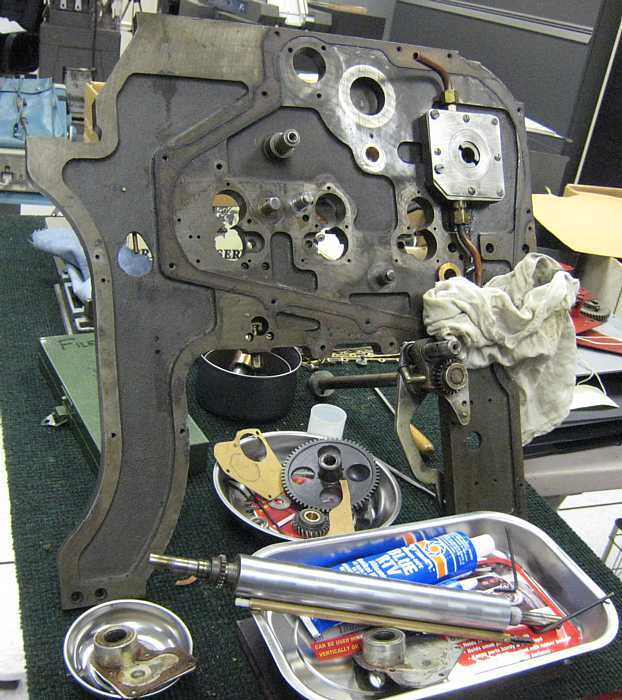 This reassembly is somewhat like re-assembling a watch - you don't want to leave too many parts out. Most of 'em probably do something. ;-)) Maybe it is more like re-assembling a gasoline engine in that various parts must do things at particular times - for instance you don't want the valves open on the compression stroke, nor the spark during the intake stroke. A little less lucky, and the machine will jam on hand turning, and you will enjoy dis-assembling it again for another try. And I am told that there are a number of ways to mis-assemble the machine that will break things when powered up. 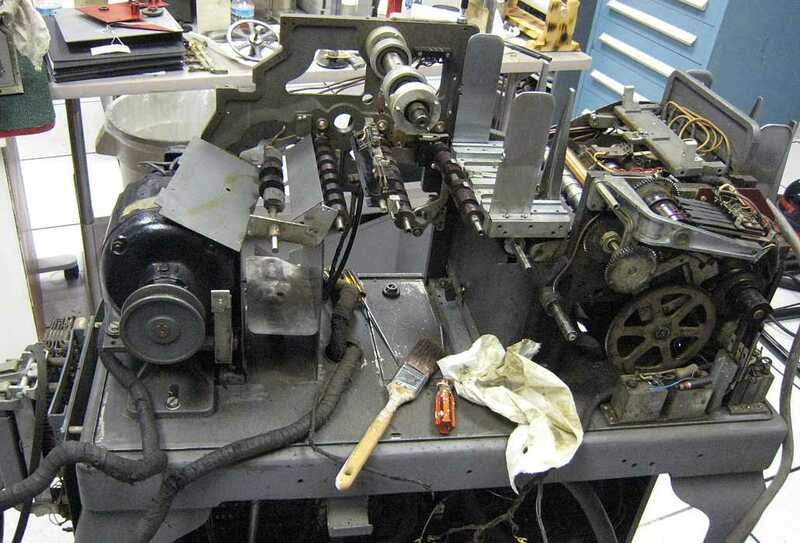 The 513 manual shows and names the parts, but rather leaves it up to on-the-job training to get the various parts "timed". Bob Erickson remembers this stuff - and we better get it recorded for the next crew!! 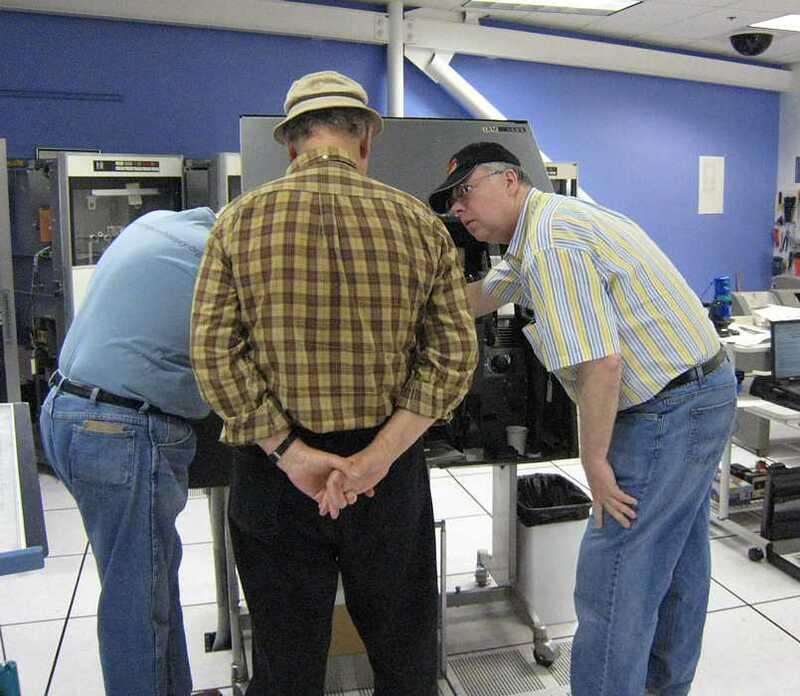 Here is Bob Erickson re-checking the alignment for Judith Haemmerle and Ed Thelen to photograph. 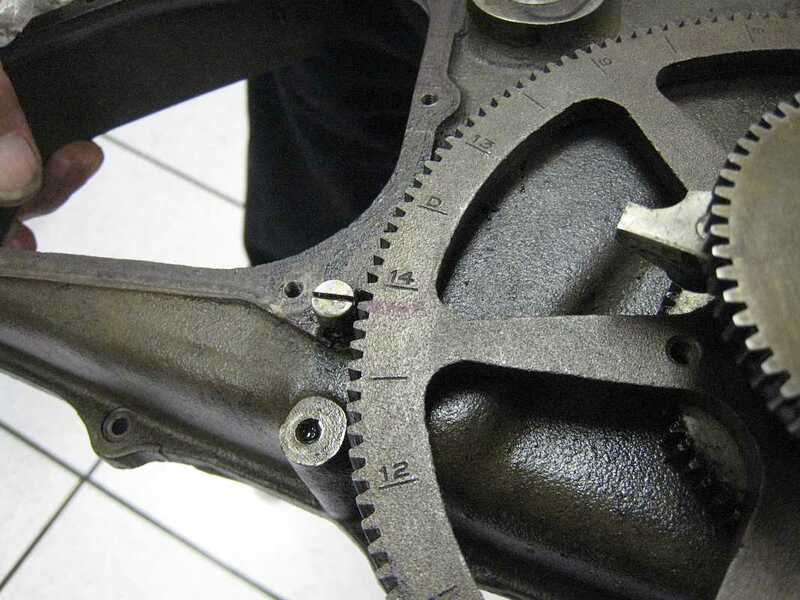 So - this is the first cut of the inside the crank case timing - and there is timing on the outside the crankcase timing that has to be right also. Oh yes, there is an electrical distribution thing on the other side of the 513. Drift Pin - stuck in hole in eccentric behind wall, to be vertical, eccentric at top dead center. (seen through hole in (G), purpose ?? ?, driven by ??? Dan McInnis dropped by, and found the tape drive working, but didn't have his Demo Test Deck in his pocket. He promised to give his new software a trial spin next time. Ed Thelen is patching his Big Print (Banner) deck so that multiple customers can be printed up in one run (as opposed to one customer per run). The 1401 halted after reading one text card. OOPS - forgot to put a word mark into the 1st position of the card read area. Ron Williams said this blunder tested the wrap-around error halt - OK - one more thing tested, and works.